Julie Cajune, a Milken Education Award recipient, is the coordinator of the tribal history project at the Salish-Kootenai College in Pablo, Montana, and previously served as Indian Education Coordinator for the Ronan Public Schools on the Flathead Indian Reservation. 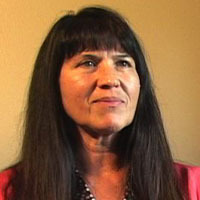 She served as Executive Producer for Heart of The Bitterroot, a DVD focused on the lives of Salish and Pend d’Oreille women. In addition to discussing the goals and accomplishments of the history project, Ms. Cajune sheds light on the 1855 Hellgate Treaty negotiations as well as more contemporary issues related to federal policies and implementing Indian Education for All. Salish Bands and Territory - Julie Cajune. Tribal Lands and Sovereignty - Julie Cajune. Cultural Understanding and the Landscape - Julie Cajune. Salish & Kootenai Tribal History Project - Julie Cajune. Tribal College History Projects - Julie Cajune. A Community Approach - Julie Cajune. A Mutual History For All - Julie Cajune. Negotiating Cultural Politics and IEFA - Julie Cajune. Experiences of Implementing Indian History and Culture - Julie Cajune. 1855 HellgateTreaty - Julie Cajune.